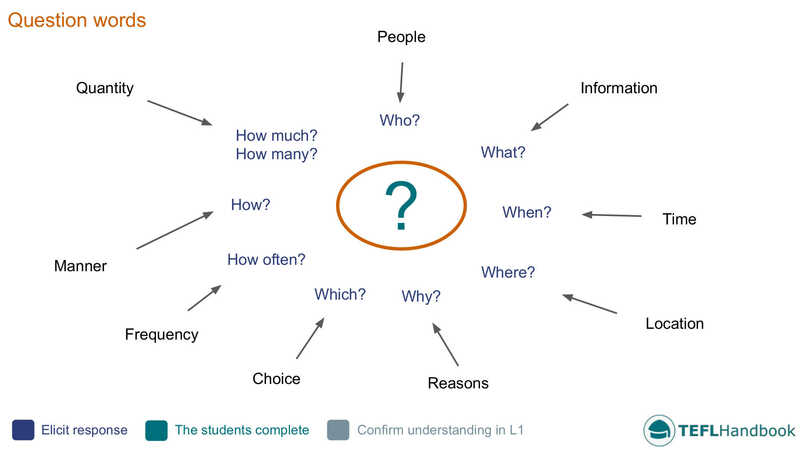 You can use the ideas here as an A2 level ESL lesson plan for teaching question words. It contains ideas for classroom activities and games, along with a list of free related ESL resources from around the web. The board work below can be used to highlight the functional uses of different question words. Start by adding the question mark and functional uses to the centre and outside of the board. Then elicit the different question words from the students. If you need to bring these materials into the classroom for reference, the TEFL Handbook app gives you offline access to all of the ESL resources on this site, plus a lot more. 1. _____cousins have you got? 2. _____do you travel to school with? 4. _____do you get to school? 7. _____do you practice sports? 8. _____do you like to do in your free time? 9. _____are you going to the concert with? 10. _____do you want to go there? 11. _____rice do you want? This is a fun group ESL activity to try with your classes. If you have completed the previous exercise, remove the questions from the board but leave the question words. Have your students stand in a circle and throw a ball or other object to each other. As they throw the ball to another student, they ask a question using one of the question words from the board. The student who catches the ball must answer the question before passing it to another student. To avoid repetition, work through the list of question words from the board, crossing each one off as you go. To begin, students will make a list of questions about a particular topic (Sports, music, movies, food). They should attempt one question for each question word. When the first two students have finished, they can start to interview each other while the others complete their lists. Student A: Where is the Eiffel Tower? The British Council have a free ESL lesson plan on Question words that is full of great ideas. 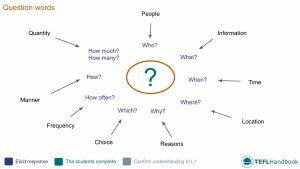 Also, the article 'How to Teach Question Structures' from BusyTeacher has some excellent advice for teachers on this topic. As usual, ISLCollective has you covered when it comes to ESL worksheets. This 'Question words' worksheet or this one of the same title complement the activities in this lesson. The British Council has a fantastic video on question formation aimed at teenagers that would be a great addition to any lesson on question words. Also, younger learners might benefit from the below video by Cambridge English Online Ltd.
Our suggested next lesson is on using the present simple. Be sure to check out our full list of ESL lesson plans for elementary students, A2 lower and A2 upper, as well as our complete selection of EFL - ESL lesson plans. If you use an iOS or Android device, have a look at the TEFL Handbook app. An ESL lesson planner for English teachers. It has a lot more content and gives you faster access to our ESL resources, making it easier to use in class.